December is here, and this is the perfect time to explore reindeer. Believe it or not, there are TONS of learning options that can make a reindeer theme deep and meaningful. This round up post offers great free resources and teaching ideas for the elementary classroom. For starters, this Pinterest board can make your planning easy. It incudes ideas for art, reading, and writing. Check it out and pin your favorites to your own boards. 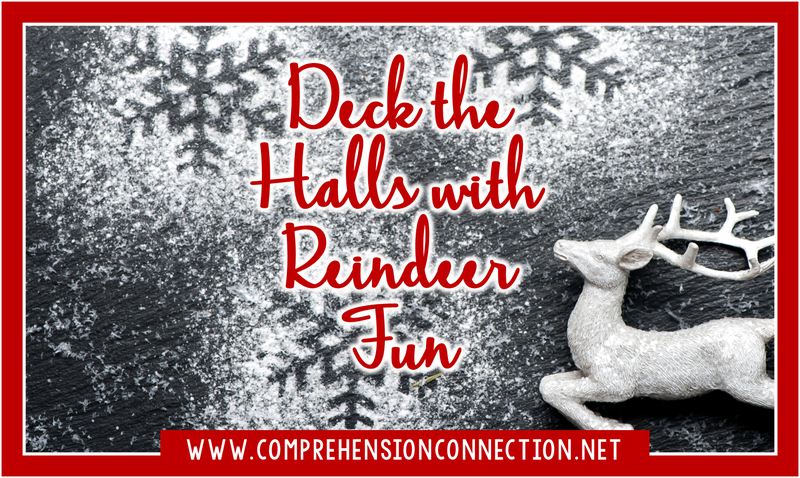 Follow Comprehension's board Reindeer Round Up on Pinterest. There are several homerun reindeer themed books, and my favorite of them all is Wild Christmas Reindeer by Jan Brett. It is a must read for every primary classroom. This unit for Wild Christmas Reindeer is available as a single unit or as part of my Christmas Book Bundle or my Jan Brett Author Study. The unit includes resources to use in guided reading as well as for writer's workshop. Questioning task cards can be used in pairs or small group too. You can check it out by clicking the unit preview to the left. 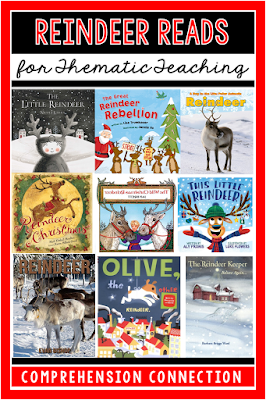 There are many other reindeer themed books too. As you can see, this list includes both fiction and nonfiction. 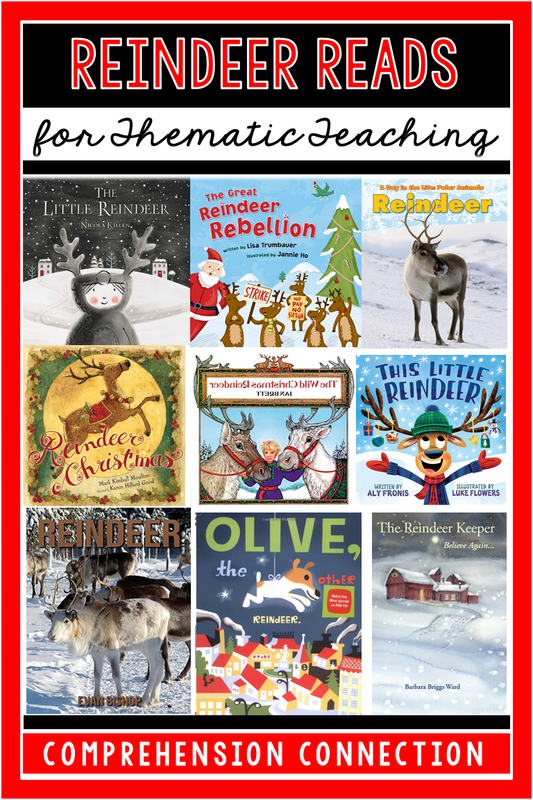 The most popular titles include Olive, the Other Reindeer, The Great Reindeer Rebellion, and The Little Reindeer. 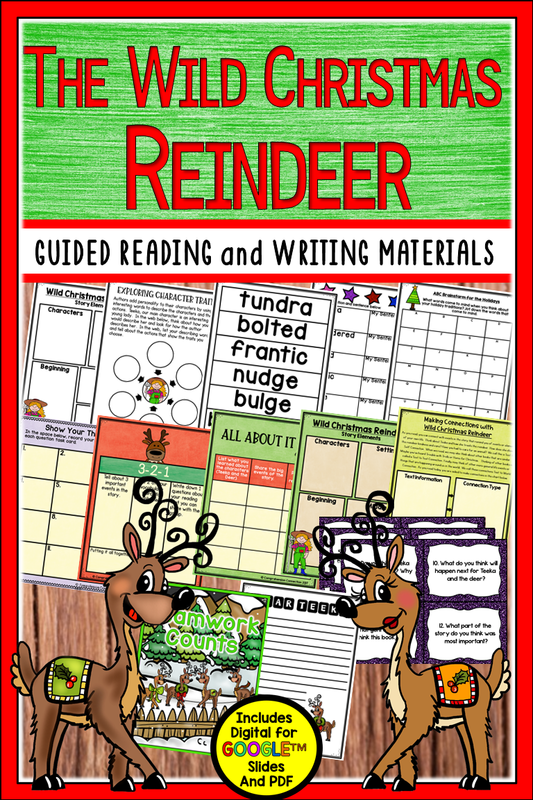 Remember, with a reindeer theme, it's important to use paired texts in order to work on reading strategies for fiction and nonfiction. Below, you'll find a variety of resources that you can incorporate into your week. Besides books, you and your students may enjoy these nonfiction options. Students love researching, and these worked very well with my students.This week, we researched Caribou with multiple resources. I had my students use Close Reading strategies with the two articles I had as well as with the websites we visited. The article to the left was perfect for my fourth graders. I used it to model how a research report should be organized. We also used the article to the right. It was intended for a younger audience, but it still offered my students a little different perspective. It is best suited to a second grade class I think. Another option during reindeer week is reader's theatre. This free script from Lisa Frase would work well for small group instruction. There are six main parts and four choral responses, so a teacher could easily use it with guided reading. It's about a goofy reindeer named Bob. If you love Reader's Theatre like I do, you might also like my latest partner script. This skit would work well paired with the Wild Christmas Reindeer since it's about reindeer problems. Sue, the reindeer trainer, is having difficulty with Prancer. She just can't get her timing down and is quite frankly *digging her hooves in*. Sue is beside herself with worry that the deer will not be ready in time and Christmas will be ruined. With the help of the lead barn elf, Jason, the two elves are able to solve the problem. Teamwork is a beautiful thing. You can check it out with the preview to the left. As if these ideas aren't fun enough (and if you are lucky to have the time for more), there are *tons* of great writing and craft options available. These were my favorites, and I hope you'll head over to my Pinterest board to repin them for later. Finally, before I sign off, I want to share one last thing. 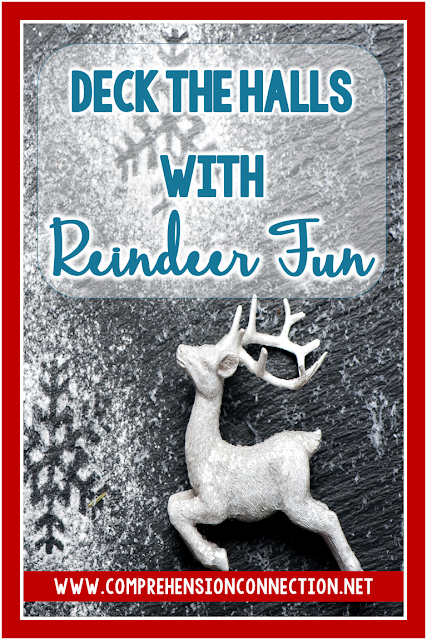 The Library Patch has this wonderful Clickable PDF available with Reindeer Websites. This made it so easy for us to be able to research safely, and I appreciate that she's shared it for all to use. Do you have a fun resource for Reindeer Week? Did you use a freebie that you just loved and think others should know about too? Do you have a blog and want to share your ideas too? The link up may be over, but you can always share your ideas in the comments. Thanks so much, and until next time...happy reading! Thank you so much. I love your weekly units. This week I am doing all gingerbread man and next week is reindeers. Perfect timing, thank you for all the great resources. Hopefully I helped you out both weeks. :-) Next week is Mittens, so plan that the first week back, okay. :-) Have a great weekend and thanks for dropping by. 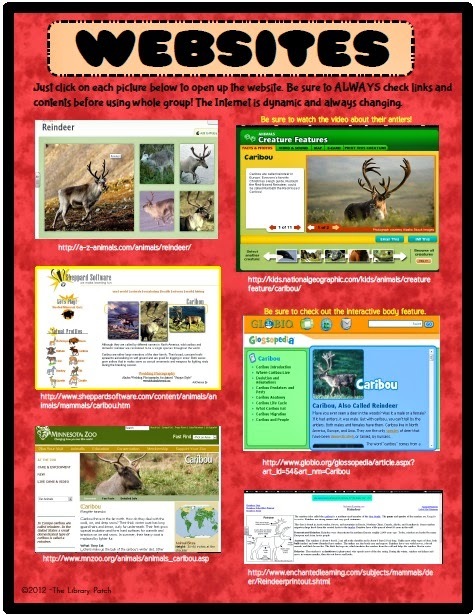 Carla, as usual your post is so thorough and chock full of good quality reindeer resources! Thank you so much for the linky!